Trying to get your “sea legs” when using Falvey this summer? Gaze through the portholes for the help you need. 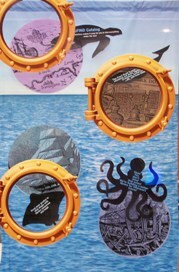 The first floor cultural window exhibit has a nautical theme: portholes, a ship’s steering wheel, silhouettes of sea life, a large lifesaver ring and seashells. Joanne Quinn, the graphic artist who designed and mounted the exhibit, has anchored these to important library services—subject librarians, document delivery, outreach events, the Information Desk (one-stop-shopping for library information and VuFind assistance), all of which can contribute to your successful library voyage. “Navigating Falvey’s Services: SEAcrets of Success” will be on exhibit until mid-August.